Membership ensures remaining at the forefront of global developments and best practice in governance. 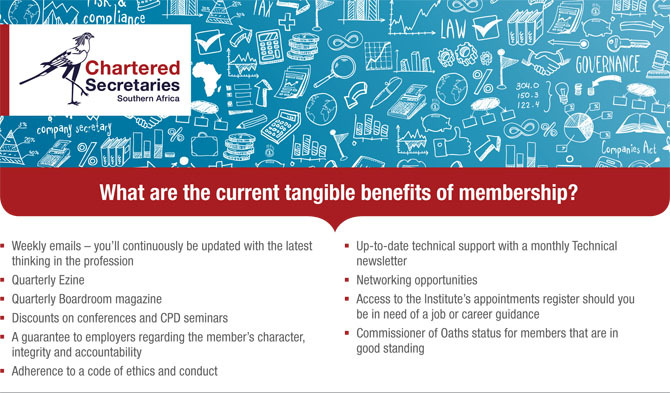 Membership, and therefore qualification as a Chartered Secretary, involves a career-long relationship with the Institute - from professional qualification through to board certification and beyond via CPD and ongoing technical support packages and tools. There are three levels of membership - GradICSA, Associates and Fellows. On successful completion of the CIS Board Qualifying Examination graduates immediately become GradICSA. Once they have gained the necessary practical experience and are deemed to be of appropriate upstanding character, they are admitted as Members at Associate-level and become Chartered Secretary (ACIS). On admission as a Fellow, the senior grade of membership granted on more extensive experience, a Chartered Secretary may include the prestigious 'FCIS' designation after his/her title. Importantly, Membership of the Institute evidences not merely academic qualifications but character, integrity and the personal good standing required in the field of governance. Membership therefore offers employers 'watchdog' accountability with recourse to the Institute's disciplinary and disbarment proceedings in the case of misconduct and/or breach by a Member of the Institute Code of Professional Ethics & Conduct. "For me, being a member of an internationally recognised Institute adds so much more value than merely having a qualification. The initials FCIS after my name indicate that not only have I passed the appropriate examinations but have also the requisite work experience to be a top-class Chartered Secretary. The continuing professional development offered by the Institute ensures that I stay relevant and continue to grow in my profession." "I am particularly grateful to the Institute for the opportunities the CIS qualification has afforded me, and is a body to which I remain very dedicated and deeply indebted."